Twenty five years after the young guns of European modernism gathered in Stuttgart to open the Weissenhof Siedlung, a “somewhat ageing” Danish architect, who as a student had been greatly influenced by the works of European modernism, was about to make his global breakthrough with a chair design which as much as any represents the post-War break with modernism and the fearless march into the new, uncertain, world. 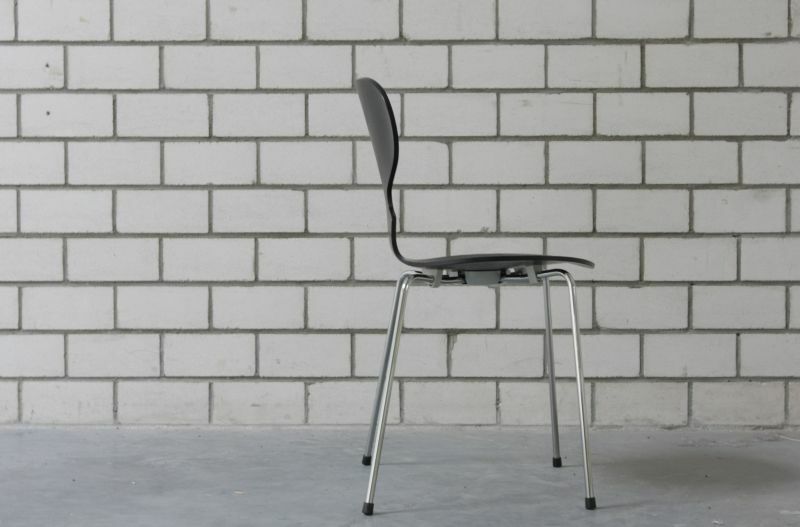 As with many classics of furniture design the Ant Chair has relatively unspectacular origins; specifically, it was initially conceived as a chair for a new canteen Jacobsen was designing for the Danish pharmaceutical company Novo. However, early on in the project’s development Jacobsen made contact with Fritz Hansen, a company with whom he had worked on projects in the past and who, more importantly, were in possession of the machines and know-how Jacobsen required for the moulded plywood seat. And as luck would have it Fritz Hansen were at that moment in time on the look out for an all purpose chair that could compete with the new products by Charles and Ray Eames for Hermann Miller. Where Egon Eiermann could always claim that any similarity was down to shared inspiration; with the Ant the fact that Fritz Hansen obtained an Eames’ DCM in order to help Jacobsen understand what they were doing, does make it all look a bit suspicious. Or would were it not for the fact that the Ant Chair contains a couple of very important innovations that sets it far above the Eames’ work of that period. 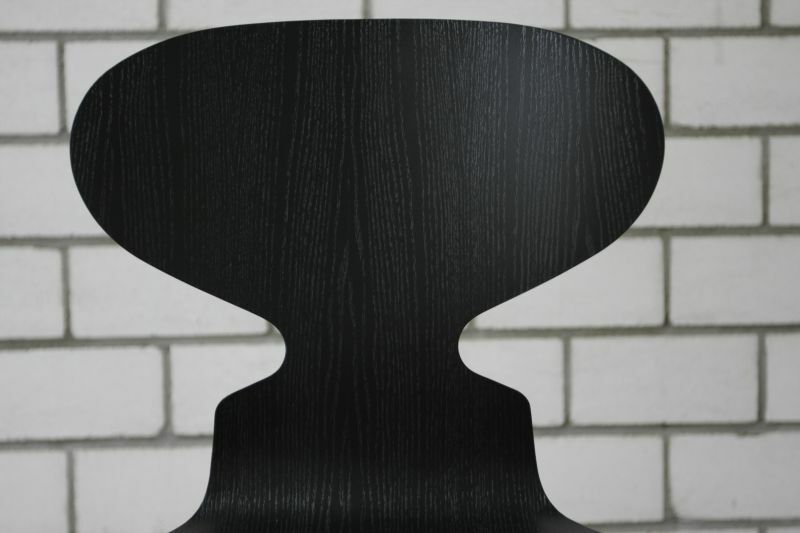 Firstly, it was the first 3D moulded plywood chair featuring a single, unified seat and back unit. The seat shell of the DCM, for example, is also folded vertically and horizontally, is however not attached to the back rest. In successfully realising this important construction process it was not insignificant that Fritz Hansen as a company started out in 1872 bending wood à la Michael Thonet, and so by the time they were trying to mould Jacobsen’s plywood shell had 80 years experience in heating and forming wood. Successfully bending the plywood was, however, only the first part of the problem. The shell had to be stable, which meant it had to be stable around the bend where seat flows into back. Jacobsen achieved this stability through the inspired addition of the cut-out slit and rounded, curvaceous “waist” – a sober, technical solution that gives the chair is characteristic form. And name. Two ladies? A lamp? ... Neither. Its inspired genius! Equally important as the technical innovation Arne Jacobsen and Fritz Hansen achieved with the shell is the fact that the Ant is stackable. For Jacobsen a stackable chair was paramount for its intended function – not only its original intended function as a cafeteria chair, but also for its new intended function as a multi-purpose chair in private homes – however, up until that point stacking chairs were more the exception than the rule. Charles and Ray Eames, for example, wouldn’t create a successful mass producible stacking chair design until the 1955 DSS. And in this context comes a second highly contenious issue: the three legs of the original Ant Chair. For Jacobsen the three legs of the Ant were non-negotiable. The Ant was to be a three legged chair. Period. Not only did such a construction aid the stackability, but for him it also meant there was less chance of the legs getting tangled up in one another in a hectic cafeteria situation. Just one example of how as a chair the Ant is brutally reduced down to aid its functionality, something that of course nods back to the very best of European modernism. For many of Jacobsen’s contemporaries however the three legged chair was an unstable insanity, and indeed such was the commotion that in 1955 Jacobsen was more or less forced by Fritz Hansen to devise a four legged version. However, at Jacobsen’s instance it remained an under the counter product that wasn’t officially marketed by Fritz Hansen until after Jacobsen’s death in 1971. 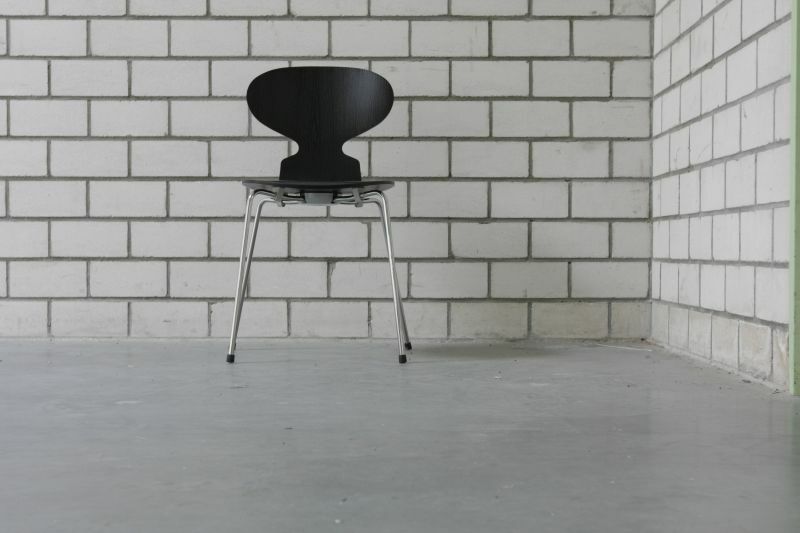 While it is fair to say that the later Series 7 chair with its more top hat like back rest is probably better known today than the Ant – not least because of the tastelessly obscene number of look-a-like products on the market or indeed that tastefully obscene Christine Keeler photo – the Ant Chair remains one of the most important chairs in post-War European furniture design and an object that everyone with an interest in good design should study and understand.